529 square metres, infinity pool, waterfall, fully landscaped gardens. Villa Type B – Last One! This Villa is 529 square metres. It is designed with the bedrooms on the ground floor and the living areas on the first floor in order to avail of the sea views. 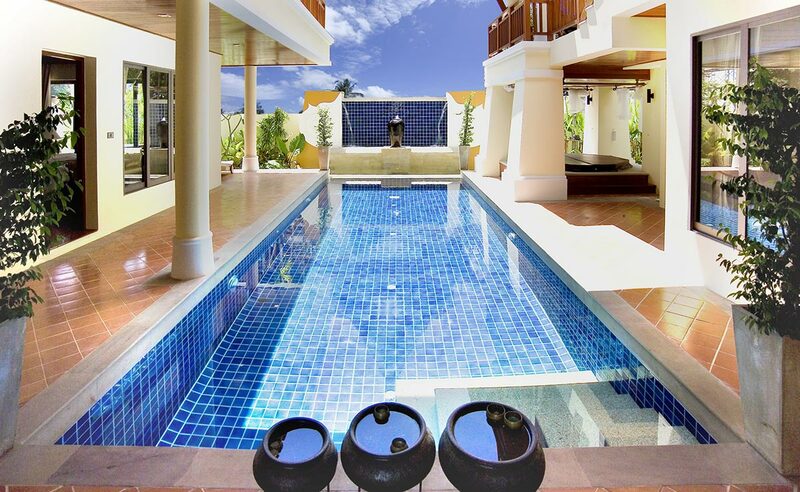 There is an Infinity pool, waterfall, fully landscaped gardens, lotus ponds, 4 bedrooms, 5 bathrooms, sauna, Jacuzzi, remote controlled double garage, laundry room, store room, fully fitted European kitchen, separate office/study, living dining area with vaulted ceilings, large outdoor balconies and bridge leading to separate Sala. On entering Villa Type B through the gilded gated entrance you are immediately confronted with raised Lotus ponds. On crossing the white sandstone steps you arrive up to the imposing 2.5 metre high wooden entrance doors. On opening the entrance doors you face the infinity pool and waterfall. The terracotta and sandstone pool decks lead off to the bedrooms, sauna, Jacuzzi and sunbathing areas. 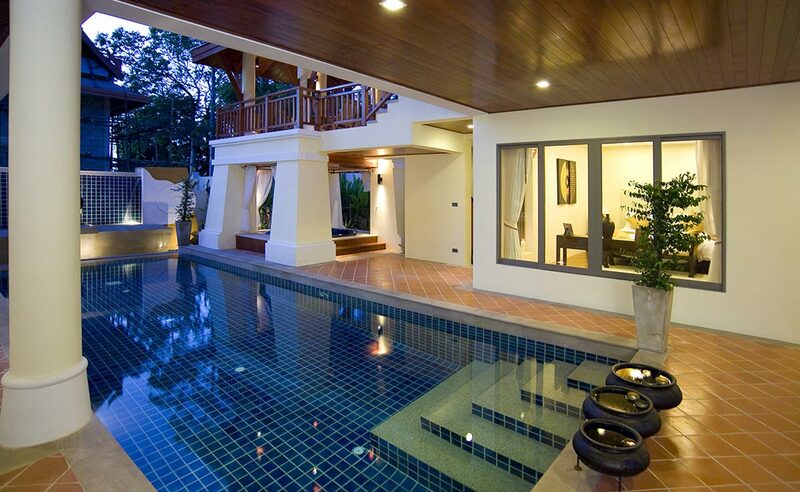 In turn when you exit your bedroom the pool is two metres from your door. The outdoor decking area is partially shaded by the Thai style roof which has been dressed in Macca wood. The large swimming pool itself has been decorated with a hand made ocean blue glazed tile, again with a white sandstone surrounding. This area also incorporates an outdoor shower for use between swimming and sunbathing. The entire outdoor/indoor area is controlled by a central sound system. Also on the ground floor is the double garage which is accessed through the remotely controlled door, the fully fitted laundry room, maids room, and storage area. The entire stairs to the first floor while being mass concrete in finished in Macca wood and Macca Handrail. Half way up the staircases is a featured 3.5 metre window before reaching the first floor landing. Again all the first floor flooring is the polished Macca wood with 6 mtr. high Vaulted wood celings. 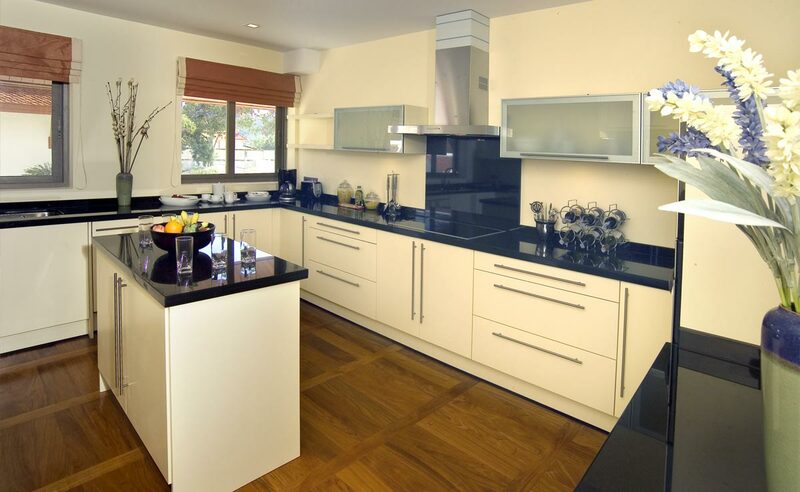 The kitchen is huge and fully equipped.The dining and living areas are open plan with floor to ceiling windows to capture the views. The first floor outdoor Sala is constructed from the same materials as the Villa and reflects the roof of the Villa. The entire interior of the Sala has been handmade in Macca wood to blend both the external and internal living areas into one. Every room on the first floor has air conditioning throughout. The Talay Sawan project is supplied directly from the water mains system but each Villa has two underground water storage tanks. The central hot water system is by Stiebel Altron. All electrical and telephone systems throughout the project have been installed underground with privately owned on site transformers. The sanitary waste water system is by way of two underground tanks leading to the main public drainage system. Alarm and fire systems can me monitored by the on site security office. Macca hardwood is recognised as been similar but superior to Mahogany and is one of the most expensive hardwoods available in Asia. 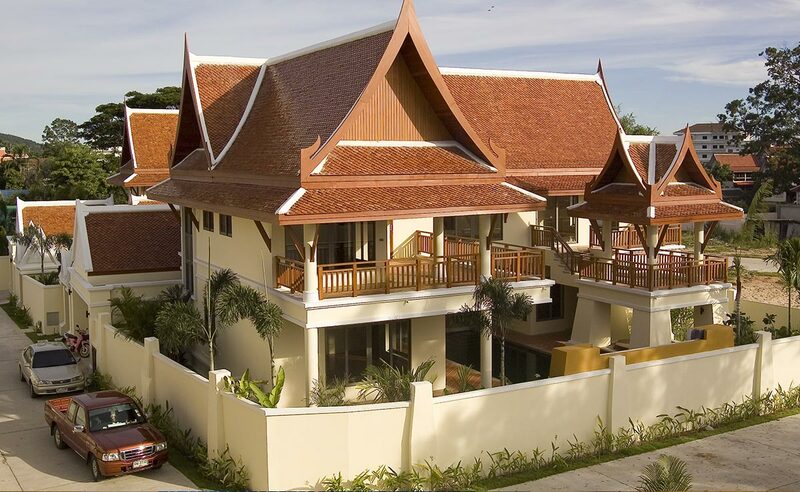 All of the woodwork has been handcrafted by the main contractor at their wood factory in Phuket. Each villa is individually landscaped. The swimming pool filtration system used throughout this project is a salination system which avoids the requirement for chlorine and chemicals.